You have officially decided to remodel your kitchen! But, now what do you do first? At Republic West Remodeling, we understand that planning a kitchen remodel is a massive undertaking with numerous variables to consider. Without a solid understanding of kitchen design trends, layout and product options, and costs, it can be difficult to know where to start. Below, we have put together some points to consider for those of you who are kitchen remodel “newbies,” as well as a refresher course for those seasoned homeowners who may be re-designing their dream kitchens once again. Spend time assessing your current kitchen. Think about traffic patterns within the space. Remodel with ergonomics in mind, making the new kitchen accessible and enjoyable for everyone in the house. Factor in the “unanticipated” and incorporate leeway for completing the remodel. Select all fixtures and materials before construction. There are many other elements to think about: For instance, do your kids do their homework in the kitchen or do you work from home? Would including a desk in the design be practical? Or, perhaps you entertain guests frequently and want an extra-long dining table? Whatever your needs, it is important to ensure they are a part of your initial design plan. Ultimately, functionality and durability should be top priorities during kitchen remodeling. Choose products that combine lengthy warranty periods with low maintenance. For example, while solid-surface countertops like quartz or granite may cost a little more upfront, with proper care, they will look exceptional for many years to come. After completing over 17,000 Phoenix home-remodeling projects since 1995, we understand that it is easy to get carried away with kitchen remodeling ideas and trends. For example, a six-burner, commercial-grade gas stove range may make a luxurious focal point, but it may not fit your family’s cooking needs or day-to-day lifestyle. Keep in mind, your kitchen remodel should not solely focus on the tools, but the overall design and functionality of the entire space. So unless you are a gourmet cook who spends most of your time in the kitchen, you may want to dedicate your budget to other features that add value, such as flooring, countertops, and cabinets. Lighting can make any kitchen look brighter and more spacious. It also can help you work efficiently and safely. 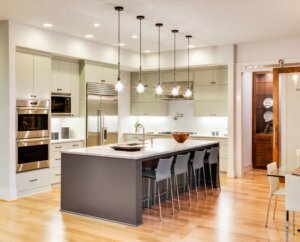 We suggest incorporating two major types of lighting in your kitchen, including task lighting and ambient lighting. With task lighting, consider under-cabinet lighting, especially since some cabinets can produce dim work areas. Pendant lights are ideal for islands, and recessed lights and track lights are popular options for sinks and general food prep areas. Additionally, wall sconces and flush-mounted ceiling fixtures, complete with dimmer switches to control intensity and mood, can help create overall ambient lighting in your new kitchen. Regarding storage, did you know that kitchens tend to be one of the most overfilled spaces in a home today? Between food storage and cooking tools, many homeowners admit they do not have enough space to store what they need. If you are going to invest in a kitchen remodel, be sure to include plenty of storage options that are both sophisticated and functional. As you design your dream kitchen space, we suggest developing two lists: a need list and a wish list. Next, price out each of your desired projects and compare them to your budget. These lists can give you a better idea of where to invest the bulk of your money and where to work to reduce costs. There are many things you can do to make your kitchen remodel more affordable. For example, some homeowners consider refacing cabinets versus having them completely replaced, or buying an appliance package from a wholesale supplier. Also, keep in mind, anything that is custom-designed or specially ordered will likely increase the cost. We can suggest a range of options that can help give you the look you want within your budget. Because every luxury kitchen-remodeling project is unique and includes many variables, it can be challenging for us to offer a general estimate right out of the gate. As such, our designers prefer to meet with you face-to-face, get to know you, and genuinely understand your dream kitchen remodel goals and vision. Following your complimentary consultation, we provide a detailed scope of work and corresponding cost before you make any decisions or commitment. At Republic West Remodeling, we promise to provide you with a great experience throughout the entire kitchen remodeling process, from creative design to detailed planning, execution, and construction. Contact us today for more information about where to start when remodeling a kitchen.